The Lord-Lieutenant recently visited the Royal British Legion Village to updated by Chief Executive, Mr Steve Sherry CMG OBE, on excellent progress made to date. RBLI is winning more attention for its integrated health and social care, which means it has something very powerful that can be replicated across the country. RBLI is a separate charity, both in governance and finance, from the Royal British Legion. RBLI has a distinct and consistent focus on service delivery, particularly in providing employment, care and housing to the Armed Forces Community. It also delivers core capabilities of employment support for Veterans and people with disabilities into the much wider community, and is committed to halving the disability employment gap. 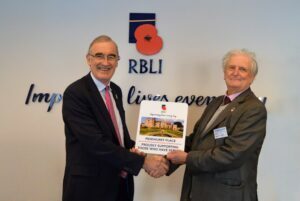 RBLI values their very close working relationship with their sister charity the Royal British Legion. Its close co-operation allows both sectors to help as many beneficiaries as possible; for example sharing many facilities on the Village in Kent and also across the UK, when delivering its LifeWorks programme for Veterans.